The Mercury spacecraft, although not designed as a vehicle for performing experiments, was used to accomplish a program of special inflight experiments not directly related to mission objectives. The major constraints imposed on the experiment program by the spacecraft were the weight and volume requirements, and the consumables required such as attitude-control system fuel and electrical power. The program evolved from an early period when no planned experimental endeavor existed through the development and implementation of an inflight experiments panel specifically chartered to evaluate the growing number of proposed inflight experiments. The inflight experimental program carried out during the Mercury manned orbital flights is outlined in this paper and the results of these experiments are briefly presented. An analysis of the results of those experiments performed in the area of the physical sciences is presented in paper 19. A major objective of the Mercury manned apace-flight program was the determination of man's ability to function in the space environment. The Mercury spacecraft was designed to sustain a man in space for a given period of time end to protect him against the accelerations and temperatures to be encountered during exit from and reentry into the earth's atmosphere. Because of the emphasis on the sustentation and protection of man in space in the design stages, practically no consideration was given to the employment of the spacecraft as a platform for specific inflight experiments. Astronaut safety was the prime design consideration; and, even in the latter stages of the Mercury Project, this concept was not compromised by the desire to perform experiments. However, an inflight experiment program was evolved in the latter stages of the Mercury Project within the constraints imposed by the spacecraft and operational requirements. The experiments, in general, fall into three categories-biomedical, physical sciences, and engineering. The biomedical experiment program is described in paper 11 and is not covered herein. This paper discusses the constraints placed on the Mercury experiment program by the spacecraft and the operational limitations, describes the procedures which evolved for the evaluation and implementation of experiments, and summarizes the Mercury inflight experiment program. An analysis of those experiments in the area of space sciences is made in paper 19. The maximum allowable weight of the Mercury spacecraft was dictated by the capability of the Atlas launch vehicle and by the requirement to achieve an extremely high probability of satisfactory orbital insertion. The entire 5-year history of the Mercury Project has been marked by a constant struggle to maintain the weight of the spacecraft within the weight constraints. Even without the addition of inflight experiments, the spacecraft weight was still increasing approximately 1 pound per week at the close of the program. After the first manned orbital mission, when it was shown that man can function reliably in the space environment and is a competent technical observer, an increasing amount of spacecraft weight was devoted to the accomplishment  of experiments. The battle to reduce the weight of the Mercury spacecraft had not been won by any means; but weight devoted to the performance of experiments was considered to be justified by the fact that Mercury became a part of a growing national program of scientific space exploration for peaceful purposes. An observation of the Mercury spacecraft interior, particularly with the astronaut in place and wearing his pressure suit, impresses one with the compactness of the spacecraft and the lack of available volume. Several worthy suggestions for experiments were rejected simply because there was no space available to store the equipment required for the experiment. A relatively small hand-held camera, for example, became a major problem because of no suitable place to stow it for launch and reentry. Although the astronauts have had available to them a personal- effects container, this storage space was rapidly filled with food, flight plans, star charts, and other paraphernalia required for the flight. Astronaut Cooper on the MA-9 mission managed to squeeze into this bag two cameras together with associated film magazines and lenses, but he experienced a great deal of difficulty in extracting and storing his camera equipment. One planned experiment could not be completed because a piece of equipment could not be taken from the container. On the two, three-orbital-pass missions, the short duration of these flights allowed little time for experimental observations. In general, on such a mission, the astronaut used the first orbital pass to acclimate himself to the space environment and verify proper systems operation. The major portion of the third orbital pass was devoted to preparations for retrofire and reentry. Thus, only part of a continuous 90- minute period was available for the performance of experiments. On both the manned three-pass missions, control-system difficulties forced the astronauts to devote their attention to flying the spacecraft. Although the time available was limited, both Astronauts Glenn and Carpenter were able to make observations of scientific interest. Even on the 34 hour manned 1-day mission (MA-9), the requirements for engineering and operational data, astronaut rest periods, communications, and other duties resulted in only a limited time available for experiments. A major constraint on the selection of experiments for the Mercury spacecraft was the small amount of control-system fuel available for experiments. At least some degree of attitude control of the spacecraft was required for practically all of the experiments. After reserves were first established for operational requirements, in particular the retrofire and reentry maneuvers, the fuel available for experiments was allocated according to priorities established for the experiments. Other limitations imposed by the spacecraft consumables were requirements for electrical power and for data-recording channels. While these limitations were not severe, they were additional considerations in the selection of experiments. Some types of experiments require an extremely accurate control of spacecraft attitude. Such fine control was not designed into the Mercury spacecraft because of weight limitations and the necessity for conserving control-system fuel. The automatic-control system, for example, had a deadband of up to 11°. The manual-control system and the attitude and rate indications to the astronaut were such that the astronaut could control the spacecraft attitude within a deadband of approximately only 2°. 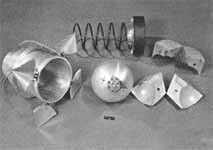 These tolerances made the spacecraft unsuitable for certain types of experiments. The optical qualities of the Mercury spacecraft window were limited to begin with, and even these qualities were considerably degraded by residue from the escape rocket which was normally ignited when the escape tower was jettisoned just after launch-vehicle staging. Future  spacecraft will require some type of high-quality optical port if precision photographic experiments are to be conducted. Prior to the MA-6 manned orbital flight, no formal procedures existed for the acceptance, evaluation, and incorporation of proposed experiments in the Mercury missions. Suggestions were made informally by organizations both within and outside of the Manned Spacecraft Center for certain types of observations or photography to be accomplished on the MA-6 mission. These suggestions were made directly to the office responsible for astronaut training activities; and, where possible, certain of the suggested experiments were incorporated into the MA-6 flight plan. With the successful accomplishment of the MA-6 mission, the original objective of the Mercury Project was fulfilled. It had been proven that man could function effectively in space and be safely recovered. With the realization that the Mercury Project was now in a position to perform certain types of experiments of scientific value from an orbiting spacecraft, the Mercury Project Office became the recipient of a large number of proposals for such experiments. These proposals originated from divisions within the Manned Spacecraft Center, other organizations and centers within the NASA, industry, and educational institutions. It was soon evident that a special organization was needed to serve as the focal point of the effort devoted to inflight experiments. (1) To evaluate inflight experiments proposed for inclusion in Project Mercury missions. (2) To propose to the manager of the Mercury Project the order of priority in which acceptable experiments should be incorporated into the program. (3) To seek out and foster the generation of suitable experiments from all available sources. In carrying out these responsibilities, the MSEP formed a close working relationship with scientists in the NASA Office of Space Sciences and the NASA Goddard Space Flight Center. The major considerations in the evaluation of proposals for experiments by the MSEP were: scientific, technical, and biomedical merit; weight of equipment; volume and location of equipment; attitude-control-system fuel required; electrical power requirement; instrumentation requirement; effect on safety of flight; state of readiness and qualification of equipment and effect on spacecraft schedule; and extent of changes required to the spacecraft. The MSEP functioned effectively for the MA-7 and MA-8 missions. With the approach of the MA-9 manned one-day mission, however, it became increasingly evident that the scope of the MSEP should be enlarged to include consideration of scientific experiments for MSC's advanced programs and to encompass a broader background of scientific interest. To accomplish this broadening of responsibilities, the MSEP was supplanted in October 1962 by the Manned Spacecraft Center InFlight Experiments Panel (IFEP). The IFEP difers from the MSEP in that its membership was enlarged to include representatives of the other two spacecraft project offices and an ex-officio member from the NASA Office of Space Sciences. Its recommendations for the implementation of experiments are made to the Director of the Manned Spacecraft Center for approval. The chairman of the IFEP is the MSC Assistant Director for Engineering and Development. It is the policy of the MSC to make maximum use, for scientific and research purposes, of the flights scheduled under approved spacecraft programs. In keeping with this policy, the Center encourages the development of worthwhile investigations which can be implemented on manned flights within the limitations of operational requirements and flight safety. To promote this policy, the IFEP has established formal procedures for the submission, evaluation, and acceptance of proposals for inflight experiments. The IFEP recommends to the MSC Office of the Director the experiments for a given spacecraft mission. With the approval of the Director, these experiments become the official experiments for the mission. An experiment coordinator was appointed from within MSC for each of the approved experiments. His responsibility was the timely development and flight qualification of hardware required for the experiment. In general, the equipment required for an experiment was furnished by the organization which had proposed the experiment. To prevent the spacecraft schedule from being affected by the integration of experiments, it was necessary to set the delivery date of experimental equipment well in advance of the scheduled launch date. In a normal prelaunch schedule for a Mercury spacecraft, the final checkouts of the spacecraft and its systems are made 8 weeks prior to the scheduled launch date. Once these tests were complete, absolutely no changes were made to the spacecraft except those dictated by flight-safety considerations. Therefore, the experimental equipment was required to be at the launch site 3 months prior to the scheduled launch in order to allow sufficient time for the installation and checkout of this equipment before the final spacecraft tests were begun. It was also imperative that the flight astronaut be thoroughly familiar with the equipment and trained in its use. It becomes apparent, then, that the selection and evaluation procedure for experiments must be completed many months before the scheduled launch of a spacecraft to allow time for the design, construction, and qualification of equipment before the required delivery date. It was specified that the qualification environments and the levels of these qualification tests for experimental equipment be no less stringent than the qualification testing that was required of all Mercury spacecraft systems. The possibility of the compromise of a Mercury mission because of the failure of a piece of experimental apparatus could not be tolerated. Failure modes of the experimental apparatus were examined very closely to assure that such failures could have no degrading effect on the mission or on pilot safety. The responsibility for integrating experiments into the mission flight plan and into the astronaut training activities was that of the MSC Flight Crew Operations Division. This division worked closely with other elements of MSC to develop a flight plan for each mission which would accomplish the mission objectives and would, at the same time, provide for the performance of experiments. It was necessary that the flight plan be completed in final form many weeks prior to a mission so that the training of the flight astronauts in the procedure trainers would conform with the flight plan. Once the final phases of astronaut training in preparation for the mission had begun, the flight plan could not be changed except for compelling reasons because late changes could seriously disrupt the astronauts training status to the point where mission safety could have been affected. This, then, was the second reason why experiments must have been approved for a given mission many months in advance. With this brief background on how the experimental program in manned space flight has evolved, a review of the results of the Mercury experimental program will now be presented. These experiments generally can be divided into two major categories. The first category, that of special inflight experiments, is the topic of this paper. The second category, that of analysis of observations and comments on the space environment and astronomical phenomena, is discussed in paper 19. The inflight experiments planned for and carried out during the Mercury Project can be grouped generally into several areas of study. These areas are: (1) visual acquisition and perception experiments, (2) general  photographic experiments, (3) radiation experiments, (4) tethered balloon experiment, and (5) several miscellaneous studies which include investigations of fluid behavior under zero gravity and of the characteristics of various ablative materials under reentry conditions. In future space flights it may be necessary for astronauts to acquire and track lighted targets either on the ground or in space to provide a backup capability for rendezvous and navigation. Visual acquisition of a target in space may also be used to back up the primary method of rendezvous with other space vehicles. Experiments were, therefore, undertaken on Mercury flights to evaluate the operational problems associated with visual acquisition from space of both earth-based lights and lighted targets ejected from the spacecraft. Ground-light experiments. Attempts were made on each of the manned orbital Mercury flights to sight known earth-based lights at night. These studies were expected to provide information on man's ability to acquire a fixed light source against an earth background and determine to what extent targets of this type would prove useful as navigational aids in space. An attempt was made by Astronaut Glenn to sight flares launched by mortars from the Indian Ocean Ship on the first and second orbital passes of the Mercury-Atlas 6 (MA-6) flight. The astronaut was unsuccessful in his attempts to see these flares, however, because of heavy cloud coverage in the area. Attempts were again made to acquire ground flares of 1,000,000 candle-power intensity over the Woomera missile range in Australia on both the Mercury-Atlas 7 (MA-7) and Mercury-Atlas 8 (MA-8) missions. These experiments were also unsuccessful on both flights because heavy cloud cover and poor visibility prevented the pilots from sighting these targets. A ground-based xenon light located at Durban, South Africa, was also used on the MA-8 mission to increase the probability of having favorable weather at one site. Unfortunately, rain and clouds obscured the light in South Africa as well as the ground flares in Australia. Another attempt to sight the xenon light was planned for the Mercury-Atlas 9 (MA-9) mission. By using statistics furnished by the U.S. Weather Bureau to determine a favorable location, the light was positioned at Bloemfontein, South Africa. Sightings were scheduled for the sixth orbital pass and in this case Astronaut Cooper was successful in acquiring the light. ground targets of this sort as navigational fixes. Weather conditions on the ground also proved to be an important factor in using ground lights, and perhaps airborne lights carried above the weather region of the atmosphere would prove more dependable. More testing is needed to prove the operational feasibility of using airborne lights and to determine flash frequencies most desirable for acquisition and tracking. Flashing-light experiment. The problem of visual acquisition of other space vehicles directly relates to the rendezvous of two spacecraft. For visual sighting of another vehicle at ranges up to 100 miles, the problems of visual acquisition and tracking need to be identified and studied. Therefore, a study to investigate some of the problems of visual acquisition of a target vehicle in the space environment was carried out on the Mercury-Atlas 9 (MA-9) flight. Figure 12-2. Assembly for flashing-light beacon. Figure 12-33. Time history of a typical flash of the beacon. a compressed spring acting against a piston when the canister covers were released. The light was powered by mercury-cell batteries, which were connected in series, and it delivered approximately 8 watt-seconds of power per flash. A typical time history of one of the flashes is shown in figure 12-3. 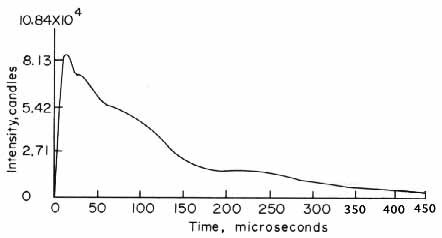 This figure shows that the light reached a peak intensity output of about 8.0 x 104 candles and that the light has a flash duration of about 100 microseconds at or above one-half peak intensity. Figure 12-4. Integrated intensity of the flashing beacon about an axis passing through the lights and inclined at 30° from the vertical. sightings tests, with Astronaut Cooper as one of the test subjects, indicated that the light intensity was approximately the same as had been measured in the laboratory. Figure 12-5. Spacecraft orientation at beacon deployment. Figure 12-6. Variation in separation distance between the spacecraft and the flashing beacon after deployment. Figure 12-7. Typical horizon definition photographs. the desired position by using horizon-sighting markings on the window for aiming. The beacon was ejected 15 minutes prior to sunset on the third orbital pass and postflight records indicated the pilot controlled attitude to within ±1° of the desired attitude. Figure 12-6 shows the calculated separation distance between the spacecraft and the beacon as a function of time after deployment. The band between the upper and lower curves represents the variation in range that might have occurred because of an uncertainty in ejection attitude. Astronaut Cooper was unable to locate the beacon on the first night pass after deployment, probably because the spacecraft was not oriented closely enough in yaw to position the light in the field of view. During the second night pass after deployment the astronaut successfully sighted the beacon and was able to change the spacecraft attitude and then return to reacquire the light. During these sightings, noted on figure 12-6, the astronaut rated the light as about one star magnitude dimmer than had been expected. For example, when the beacon was between 7.5 and 9 nautical miles away at 2 hours and 14 minutes after deployment, the light was described as not very bright but discernible, about the order of a third magnitude star. The light was also seen during the third night at a range of between 9.5 and 11.5 nautical miles and was rated as very, very weak and just barely discernible. In general, the flash was found to make the light easily distinguishable from stars. The beacon's intensity and flash rate appeared to be adequate for acquisition distances of up to 8 nautical miles at night which corresponded to a light intensity of about a second magnitude light. Horizon-definition photography. Horizon definition photography was conducted on two Mercury space flights to assist the Instrumentation  Laboratory of the Massachusetts Institute of Technology (MIT) in determining the effectiveness with which the earth's sunlit limb could be used for navigational sighting during the terminal phase of advanced space missions. Photographic studies were carried out on both the MA-7 and MA-9 flights. 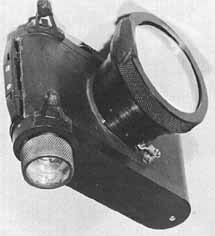 A 35-mm Robot camera was flown in MA-7 and a 70-mm HasseIblad was used as the photographic device for MA-9. For both flights, a special red and blue split filter was inserted in the field of view just ahead of the film plane. This filter was used to provide information on the resolution and effectiveness of using the limb as a navigation aid at the two extremes of the visible spectrum. Data obtained from these photographic studies are presently being analyzed by Instrumentation Laboratory scientists under the direction of Dr. Max Peterson. Limited results of the MA-7 flight have shown, as expected, that the earth's limb viewed through a blue filter has a somewhat higher elevation than when viewed through a red filter. This distinction is clearly evident in figure 12-7 which shows typical photographs obtained on both the MA-7 and MA-9 flights. The MA-7 flight results have shown that contrast and definition are improved when viewed in the longer wavelengths of the visible spectrum (see fig. 12-7). The limb viewed through a blue filter is expected, however, to provide a better navigational reference because the blue limb appears more stable and is not as subject to interference effects from clouds and other atmospheric conditions as is the red limb. The MA-9 photographic study was conducted to provide additional information on the limb elevation viewed through the red and blue filters. It was also planned to obtain information for determining the radiance of the limb, for evaluating the effect of variations in scattering angle of incident light on limb height, and to establish the height of the limb above the surface of the earth. To accomplish these objectives, it was planned to take a series of photographs in the four quadrantal directions relative to the sun, of the setting moon near the earth's limb, and of the limb during the daylight period of most of an orbital pass. It was not possible to obtain the daylight-period photographs on the MA-9 flight because of operational difficulties during the period in which this photography was planned. A preliminary analysis of the MA-9 photographs taken substantiates the initial results of the MA-7 flight. Although the analysis is not yet complete, it is expected that the limb radiance in both the red and blue portions of the spectrum can be fairly accurately established. An accurate determination of the height of the limb cannot be made by using data from the MA-9 flight, however, because the image of the moon is too distorted and indistinct. The film and dust layer which collected on the spacecraft window might well have contributed to this indistinct image. Although no significant difference in limb height was noted when the four quadrantal photographs were compared, much more data covering a wide variation in the angle of incidence of sunlight striking the atmosphere are needed to determine the effect of variation in scattering angle on limb height. In order, therefore, to establish the value of the earth's limb as a navigational reference, additional studies are needed to determine limb height and the variation in this height at different scattering angles of incident light. Weather photography. Weather observations and photography were carried out during the Mercury flight program to augment other meteorological information and to provide specific information that would be useful in designing advanced weather satellite systems. On both the MA-6 and MA-7 missions, cameras equipped with special film and filters were carried on board for photographing interesting meteorological phenomena. However, because of difficulties arising during each of these flights, no photographs were obtained. Meteorological data obtained on these missions were derived from the astronauts' observations and the general-purpose color photography. Figure 12-8. Photographic equipment used for Weather Bureau experiment. Figure 12-9. Weather photograph of a region of the South Atlantic, southeast of Brazil taken by Astronaut Schirra on the MA-8 flight. Figure 12-10. Weather photograph of the Baja California area taken by Astronaut Cooper on MA-9. MA-8 mission a wide bandpass Wratten filter consisting of six elements varied in range of spectral transmission from blue to far red. Neutral density was added to each of the color filters to produce a nearly uniform neutral density over the entire spectrum examined. Film sensitivity extended from 3,700 Å to 7,200 Å thus limiting the wavelength response to 7,200 Å. Figure 12-9 is a photograph from the series obtained during the MA-8 flight and was taken over the South Atlantic on the fifth orbital pass. It was exposed at an altitude of 140 nautical miles viewing northwest toward the southeast coast of Brazil approximately 1,000 miles away. Analyses of this and other photographs of this series were carried out by Mr. Stanley Soules of the National Weather Satellite Center to provide design inputs to future weather satellites. Results from the MA-8 light indicated that contrast increased with wavelength in the visible spectrum as shown by figure 12-9. These results indicate that the optimum wavelength for viewing the earth might be the near infra-red spectrum where scattering by atmospheric particles is relatively low. The MA-9 weather photography was conducted to investigate this hypothesis by using infra-red film and a special filter shown in figure 12- 10. This filter divided the infra-red spectrum from 6,600 Å to 9,000 Å into three parts. To accomplish this division of the spectrum, the filter was divided into three sections each having the bandpass width shown in figure 12-10, which is a typical photograph and was taken over southern Arizona looking westward. As pointed out by Mr. Soules in his analysis of these results, water has a very low reflectance in the near infra-red as shown by the dark portion on the left of the photograph covering the Pacific Ocean. Clouds and land have a very high reflectance; hence, coastlines and cloud patterns over water are easily discernible. However, as illustrated by the figure, clouds are more difficult to detect over land area because both the clouds and land areas covered with green vegetation have a high reflectance. Terrain photographs. Terrain photographs have constituted a portion of the general purpose photographs on each of the four manned orbital flights. However, they were specifically scheduled as a part of the flight plan on only the MA-8 mission. On the other three flights, terrestrial photographs were taken when the opportunity arose rather than as specifically planned activities. These photographs were taken to aid in building up a catalog of space photographs of various geological features such as folded mountains, fault zones, and volcanic fields, and to provide topographical information over a major portion of the earth's surface. They were taken on each flight by using highspeed color film in the general-purpose camera carried aboard for the flight. The following table lists the camera and exposure settings used on each flight. Generally, the terrain photographs of the first three manned orbital flights were of poorer  quality than those obtained on the MA-9 mission, although some useful photographs were obtained on each of these flights. The reduced quality of the photographs on these first missions resulted primarily from the much poorer weather conditions that existed over the land areas of the earth and by the limited land area covered during the flights. It was quite fortunate that worldwide weather conditions during the MA-9 mission were much better than on previous flights; and because of the favorable weather and the fact that the flight covered many land areas of the world, excellent photographic coverage, particularly regions of the African and Asian deserts and the Himalaya mountains, was possible. Preliminary analysis of these photographs has been made by Mr. Paul D. Lowman of the NASA Goddard Space Flight Center and is presented in paper 19. As a result of the analysis of these photographs, Mr. Lowman concluded that potentially useful geological and topographical information could be obtained from all terrain photographs taken during orbital flight. The quality and resolution of these photographs approached or equaled that of the black and white exposures from the best rocket flights. Figure 12-11. Modified Robot camera used for MA-9 dim-light photography. Of Physics, University of Minnesota, was carried out for the MA-9 mission to obtain photographic data on two dim-light phenomena best observed outside the earth's atmosphere These phenomena are the so-called zodiacal light and the night airglow. Photographs of the zodiacal light were needed to assist in determining its exact origin, geometric distribution, and relationship to solar radiation and flare activity. Data on the airglow were needed to define the layer further and to provide information on the solar energy conversion process occurring in the upper atmosphere. Figure 12-11 shows a photograph of the 35-mm Robot camera as it was modified for this experiment. The camera was equipped with an automatic film advance and had a fixed lens with an equivalent speed of f/0.95. Exposures were timed manually, and the camera controls were simplified to improve operation by the astronaut in a pressure suit. Three small supports or "feet" (see fig. 12-11) were provided to aid the pilot in positioning the camera against the window for aiming. Photographs, varying in exposure time from 1 to 30 seconds, of the zodiacal light were to begin immediately after sunset and were to cover the ecliptic region from sunset to about 30° of arc past sunset. Photographs of the airglow layer were to be taken periodically over an entire night orbital pass with exposures varying in duration from 10 to 120 seconds. Figure 12-12. Photograph of the airglow layer taken by Astronaut Cooper on the MA-9 flight. delay in initiating the sequence or an error in exposure time could have caused these unsatisfactory results since the gradient in zodiacal light intensity varies quite rapidly near the sun. The airglow photographs, however, were of quite usable quality. A representative photograph from this experiment is shown in figure 12-12. Preliminary analysis of these photographs by Dr. Edward P. Ney and associates at the University of Minnesota has shown them to be useful in determining surface brightness of the airglow layer. These photographs also were found to be valuable for assessing the height of the layer with varying latitude, in measuring the angular width of the band, and in determining angular displacement above the earth's horizon. Considerably greater discussion of this phenomenon is presented in paper 19. Figure 12-13. Variation in predicted flux at 100 km in the anomaly of the earth's magnetic field over the South Atlantic on the MA-9 flight. Increased flux density shown by increase in amount of shading. Some form of radiation measurement has been included on all Mercury space flights to record the dose received by the astronaut and to furnish experimental environment over the Mercury altitude profile. (1) Studies in which film or lithium-fluoride thermoluminescent detectors were used to measure the dosage to the astronaut. (2) Emulsion packs and ionization chambers to measure the radiation level inside the spacecraft. 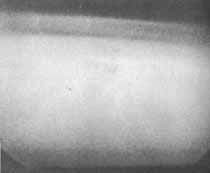 (3) A package containing Geiger-Mueller tubes to measure the electron flux external to the spacecraft. Film badges and thermoluminescent detectors used to monitor the electron dose to the astronaut were mounted on the helmet and on the chest and thigh of the astronaut's undergarments on each of the final two manned orbital flights. Evaluation of these detectors has shown that the radiation dosage received by the astronaut is quite low, less than that normally received by a man from cosmic radiation in 2 weeks on the surface of the earth. Emulsion packs carried on the MA-8 and MA-9 flight at several locations inside the spacecraft as well as an ionization chamber mounted on the spacecraft hatch were used to assess the radiation level inside the spacecraft. Data obtained from these crevices generally agreed with results derived from the film badges and showed a very low radiation level inside the spacecraft. Radiation measurements were made on the MA-9 flight to map the electron flux in an anomaly of the earth's magnetic field occurring over the south Atlantic Ocean where the radiation levels are expected to reach a peak in the Mercury orbit. (See fig. 12-13.) Variation in between radiation intensity is indicated by the variation in shading in this region. Measurements were taken in this region on the seventh orbital pass as indicated by hatched region on this figure. Operational problems interfered to some extent with completing all of the scheduled measurements. Figure 12-14. Geiger-Mueller tube installation on the MA-9 spacecraft. 12-14. 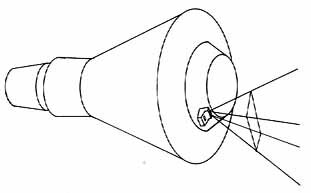 The other tube viewed essentially a hemispherical area about a direction 40° below the roll axis. The uncollimated tube was shielded to reject all electrons having energy levels less than 2.5 mev to avoid saturation, and because the radiation level in the anomaly was much lower than anticipated the shielded tube was never energized sufficiently to record usable data. Usable data were recorded by the collimated tube. Figure 12-15. Results showing artificial electron flux decay in the magnetic anomaly over the South Atlantic. in the figure. The electron belt is shown to have decayed as predicted by several orders of magnitude during the time period between MA-8 and MA-9 flights, possibly because of atmospheric collisions or other processes. A 30-inch mylar inflatable sphere was packaged in the antenna canister of both the MA-7 (see ref. 1) and MA-9 Mercury spacecraft. These balloons were to be ejected, inflated, and towed at the end of a 100-foot nylon line through one orbital pass to measure the drag experienced by the balloon throughout the orbit. The measured drag could then be readily converted into air density over the Mercury altitude profile. In addition, it was hoped that the astronaut could obtain some sightings yielding visual data on objects in close proximity to the spacecraft. The design, construction, and qualification of the equipment used on this experiment were carried out by the NASA Langley Research Center. The components of the equipment are shown in figure 12-16. The results of this experiment conducted during the MA-7 flight are contained in reference 1. Briefly summarized, the balloon was deployed satisfactorily but was only partially inflated; hence, little useful data were obtained on this flight. By a thorough investigation of the MA-7 failure, it was concluded that the balloon failed to inflate because one of the seams connecting the many gores comprising the balloon skin pulled apart. Figure 12-16. Balloon canister assembly. control of balloon construction was maintained throughout the development program and numerous deployment and inflation tests were conducted by the Langley Research Center to insure the quality of the device. These tests were conducted with the flight equipment under conditions which closely simulated the space environment without a single failure. Numerous squib firings were made, without a single failure, to insure that either one or both of the squibs used to unlatch the cover of the canister would accomplish this task. The assembled unit was carefully checked after installation on the spacecraft and was found to be satisfactory. It was, therefore, believed that this experiment was well qualified for flight, but unfortunately the balloon failed to deploy in flight. Failure was attributed to some malfunction in the squibfiring circuit that released the hatch cover of the balloon canister. The exact cause of this malfunction could not be determined because the circuit was contained in the spacecraft antenna canister which is jettisoned prior to landing. Study of liquid behavior at zero gravity. An experiment sponsored jointly by the NASA Lewis Research Center and the NASA Manned Spacecraft Center was developed to examine the behavior of fluids of known properties in a weightless state by using a given container configuration and was flown on the MA-7 mission (see ref. 1). Basically, this experiment was intended to provide data that would complement and extend work already carried out at the Lewis Research Center. Data obtained from this study were expected to provide information relating to the tankage and fuel transfer requirements on future space missions. The results of this experiment are well defined in reference 1 and other NASA publications dealing with this subject. It need only be noted here that the limited results obtained on this experiment generally tended to verify past experimental and theoretical data obtained from laboratory studies. Figure 12-17. Location of ablation panels on the Mercury spacecraft used for the MA-8 flight. Upon completion of the MA-8 flight, each strip of ablative material was removed from the spacecraft and examined to determine char depth and temperature distribution and to examine the material for delaminations, pitting, and cracks. It was not possible to compare the panels collectively because of significant circumferential variation in heating around the cylindrical section, probably caused by a spacecraft angle of attack of 2° during high heating. As expected, all samples showed an increasing thermal exposure and char depth with length aft (away from the blunt end) along the specimen. No material, regardless of the heat rate to which it was exposed, showed any marked superiority in performance over that of the other specimens although the elastomeric materials did prove superior to hard ablation materials in limiting the growth or delamination of intentional cutouts. Surface effects and imperfections noted during preflight ground testing were also evident during the postflight analysis, but to a lesser extent. However, the scaling effect when comparing the relatively large specimens flown with those tested in a ground facility has not been established. 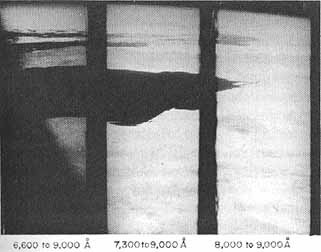 Figure 12-18.-Photograph of the surface pit on the window of the MA-9 spacecraft. X42, top and bottom lighted. surveys were made of the areas in which any indications of impact were noted. 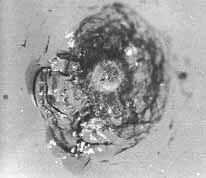 As a result of these examinations, no evidence was found that could be construed to be a micrometeorite impact. Microscopic mapping of the vycor window of the MA-9 spacecraft, was performed before and after the mission. During the postflight survey, one small surface pit was detected on the outer surface of the MA-9 spacecraft window. A photograph of this pit is shown in figure 12-18. This surface pit has the circular shape, depth to width ratio, and general characteristics of a hypervelocity impact in basalt. Further analysis is in progress to ascertain whether or not the pit resulted from a micrometeorite impact or was caused by spacecraft debris encountered during reentry. 1. BOYNTON, JOHN H., and FIELDS, E. M.: Spacecraft and Launch-Vehicle Performance. Results of the Second United States Manned Orbital Space Flight, May 24, 1962. NASA SP-6. Supt. Doc., U.S. Government Printing Office (Washington, D.C.), pp. 1-14. 2. BOYNTON, JOHN H., and FISHER, LEWIS R.: Spacecraft and Launch Vehicle Performance. Results of the Third United States Manned Orbital Space Flight, October 3, 1962. NASA SP-12. Supt. Doc., U.S. Government Printing Office ( Washington, D.C. ), pp. 1-11.